There were two opportunities this week for me to compare internationally acclaimed masters in their field against uniquely Scottish national treasures in the same disciplines. I often forget about the Hunterian Art Gallery at Glasgow University but the posters advertising their Rembrandt exhibition, "Rembrandt and the Passion", brought me along this week. I'm no religious authority but that is the second Passion themed thing I've seen this winter, and even I know this would chime better at Easter. Last time I was in here there were clearly a few leaks in the roof and the layout was looking a bit tired, but I was delighted to see that it has all been renovated and re-hung. All of my favourite paintings are still there and JD Ferguson's Les Eus, Joan Eardley's paintings and their unique array of Whistler's are all allowed to shine. If you've not been in a while, go and stick your head through Paolozzi's doors and have a look. The temporary exhibition upstairs is built around the gallery's "Entombment Sketch" by Rembrandt, a wee picture I'm familiar with as it has hung in the Gallery forever. 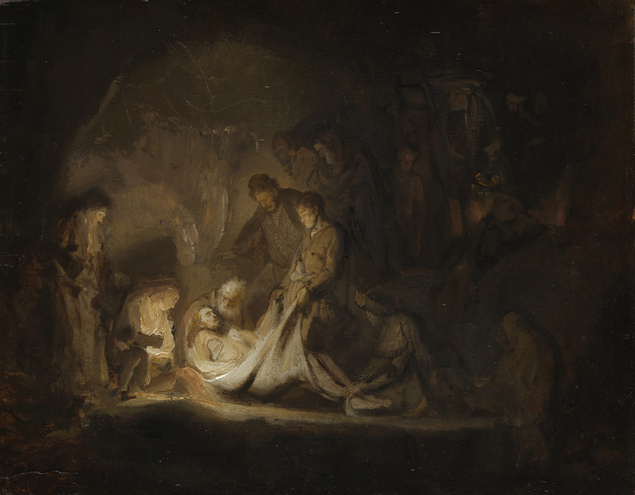 However it does merit the extra attention it gets in this exhibition, hung alongside some of his other paintings (including his "Entombment of Christ" painting on loan from Munich), etchings and works of other artists of the Passion story. It is all very interesting, but £5 entry was a bit steep considering it is usually free to see it on its own. In the main hall at the Mitchell Library just now is a retrospective of the work of George Wyllie, who died earlier this year aged 90. If you don't think you know his stuff then think back to the huge 'paper boat' floated down the Clyde or the straw locomotive that was hung from the Finnieston crane in 1987 and then burnt (a model of it and a box of the ashes are on show here). He is a David Shrigley, with a blowtorch. At present there is a large question mark hanging from the Finnieston crane in tribute to the man, who described himself as a "Scul?tor". His work was often playful and fun, but usually had a political edge or carried a message about Glasgow's declining industrial hinterlands. His family have brought together a great selection of his work from early paintings to major sculptures for this exhibition, titled "In Pursuit of the Question Mark". I've always liked his stuff and his "Just In Case" giant nappy pin sculpture that sits at the former site of Rottenrow Maternity Hospital always raises a smile in me when I pass it. Hopefully this exhibition will inspire someone to fix the clocks in his running man sculpture outside Buchanan Bus Station. I'll definitely be back to see this exhibition again, which is free and on until February 2013 and I'll bring my kids, who will love it. Saying that, however, on balance I'd give this one 2-3 to Rembrandt. Despite Wyllie having the home advantage, the big man from the Netherlands just wins here thanks to his superior technique. This week I also had the chance to compare and contrast the music of Aidan Moffat and Bill Wells in Cottiers on Wednesday night with that of Wagner's Tristan and Isolde performed by the BBC Scottish Symphony Orchestra at the City Halls on Thursday. This really was a Champions League clash of techniques, the Scottish underdogs playing their homely tunes against Teutonic efficiency, complex chromaticism and one of the finest orchestras in the country. Rick Redbeard, lead singer of The Phantom Band in folkish guise, strumming his acoustic guitar opened and has a solo album out next year. Next up was Aidan Moffat and Bill Wells, who won the inaugural Scottish Album of the Year award in June for "Everything’s Getting Older", a mixture of spoken word pieces, alcohol sodden songs and a quintessentially Scottish glumness. I last saw them perform songs from the album at a gig in Paisley and now about 18 months later it was nice to see how the live arrangements have evolved. Bill was at piano, with a trumpeter up front and Aidan on drums, vocals and bits and bobs. The 10 minutes on the album from "The Copper Top" through to the brutish "Glasgow Jubilee" are some of my favourite minutes of music and it was good to hear those tracks again. He promised a cover version tonight and although he seemed sorely tempted by an audience request for Chas ‘n’ Dave’s "Ain’t No Pleasing You" he settled for Black Heart by girl group Stooshe instead. If you follow Aidan’s drunken MTV music reviews on twitter you’ll know that this type of pop trash is what he loves at 4am. There were also outings for some tracks that they thought "too cheery" to make the album. He is always an entertaining performer and I think I’d enjoy hearing him read a shopping list over Bill Wells’s mournful piano and the muted trumpet, but the wee tales he tells of mundane ordinariness are great. By contrast the following night I was out to see Act 2 of Wagner’s Tristan and Isolde, a concert performance over three evenings of the opera, being performed by the BBCSSO. First on stage was author AL Kennedy. I like her Scottish dourness, love her books and she gave an interesting talk, bizarrely interrupted by a persistent bluebottle that landed on her mic and politely listened to the last 5 minutes. I really wonder what the Radio 3 audience would have made of her stopping mid-sentence to utter such things as "Go away, I don’t want to kill you". Presumably they were able to edit these bits out. I had enjoyed the first Act a few weeks ago and it had ended on a cliff hanger. The music and orchestra were fantastic, I particularly liked the bit where Tristan and Isolde meet to the crashing music of a thunderstorm rather than to sounds suggesting joyful love lies ahead. As before, it takes a strong voice to carry out to the audience with the orchestra right at your back rather than in the pit, and there were some cast changes from Act 1 which made for an odd continuity. Nina Stemme's Isolde was released from the Sinex she had to resort to a couple of times on the last outing and was strong and impressive. Her new Brangane, Jane Irwin, had a fantastic voice and presence. Our new Tristan, Robert Dean Smith, however was a shadow of the Tristan from Act 1. Not only did he dress more prissily than everyone else, in his tails and white bow tie, he sang more prissily too, not having the volume to carry his words over the orchestra. So he made an unconvincing subject for Isolde's passion. Peter Rose entered as King Mark towards the end and his booming baritone was full of pathos. Because they are singing, not acting, we were left with a cliff hanger again as Tristan sings "On guard, Melot" and the act ends (you don't get to see him throw aside his sword and allow Melot to severely wound him). So I'm looking forward to Act 3, and as each act lasts 75-90 minutes I can see why it merits this type of treatment, and again focusing on the music of Wagner is enjoyable. However the next act is in April, which does seem a wee bit far away. So I'd give this one as a surprise victory for the plucky Scottish underdogs who took full advantage of playing in front of a home crowd. The German played a solid game, but couldn't deliver that knockout blow. Aidan Moffat and Bill Wells 3-1 Wagner. This was all a convoluted metaphor to allow me to shoehorn in a mention of Scotland's football match of the week. No, not Celtic's impressive 2-1 victory over Barcelona, but Partick Thistle's storming dismantling of their main promotion rivals, Dunfermline, this afternoon. 5-1 it ended and Dunfermline were lucky that was all we scored. It was a great game, a great crowd of over 5200 and a wee suspicion is circulating around Firhill that we are looking bloody good this year. Next home game is in 2 weeks, vs Livingston on the 24th November. If you haven't seen them this year, drag yourself along. What's on in Glasgow this week?